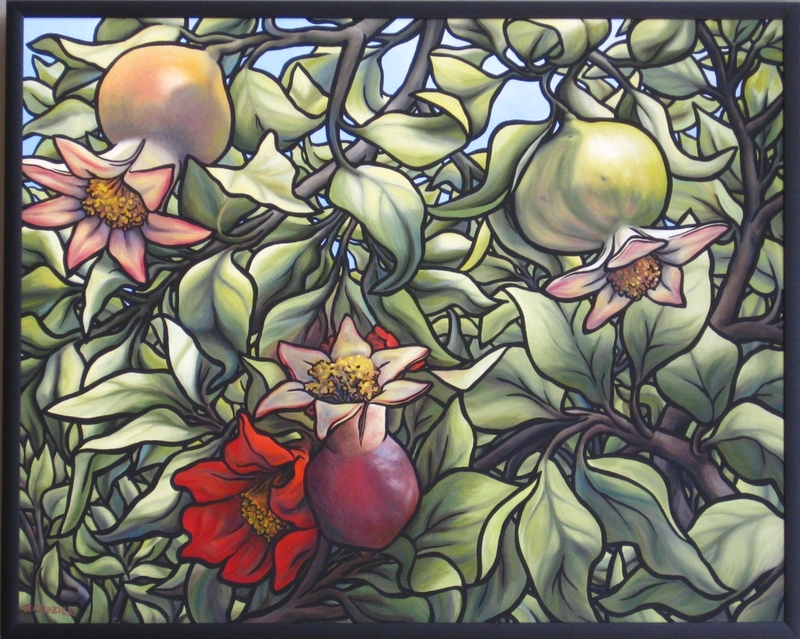 The Blue Heron Gallery and Studio is home to the artwork of Julia Crozier and a number of artists fine work. In the front is the gallery showcasing oil paintings, chalk and oil pastels, linoleum prints, ink wash artworks, along with jewelry, cards, silk scarves, and other smaller gift items. She shared with me some of her thoughts about her art. Julia likes to paint abstractly because the story of the artwork unfolds as she works. In viewing the painting some parts may not be as noticeable at first, but as the viewer continues looking more parts of the painting unfold. She said that is what is so fascinating with abstract art, you see more and more as you look at it. South Dakota, a primitive part of the Badlands. 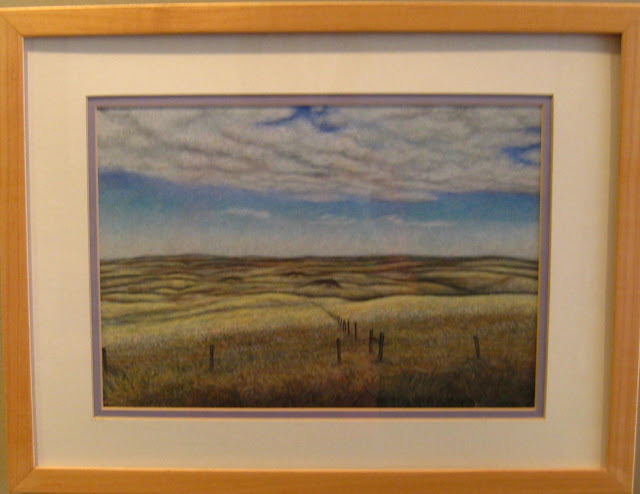 As a child, her family traveled to the Western United States. Those wide open spaces call to Julia. She has traveled there often with her parents, sister, husband, and daughters. Julia uses sketching to remember a landscape. She takes many photographs to remind her of the images of a landscape as well. Sometimes, Julia does not have art materials with her or the time to devote to a sketch is not available. Instead of relying on sketches or her camera, she is working with her memory to recreate the feeling and the look of a landscape. She takes those essences of the land and paints from her memory. It is a skill; she practices often. 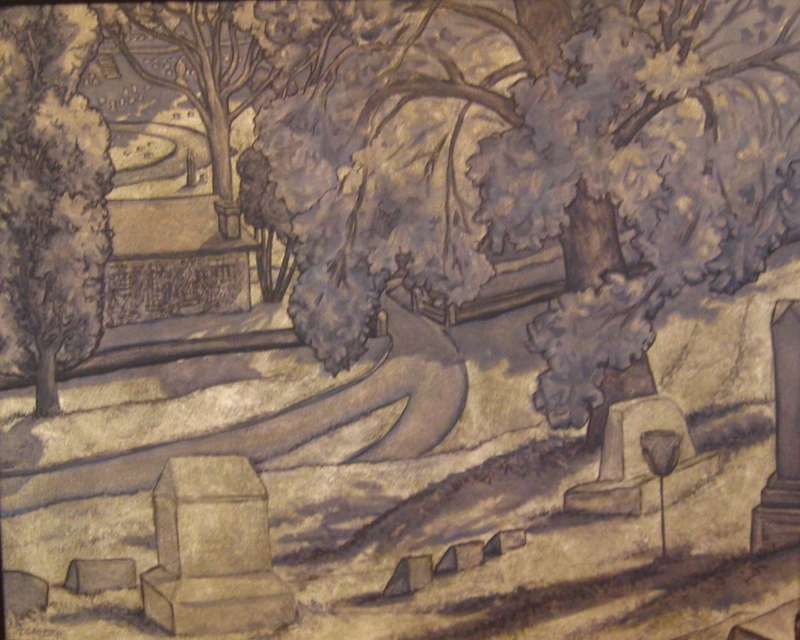 This painting started as a drawing created on site at Woodlawn Cemetery. Its tonal quality of black and grey gives it a moonlight feeling. However, there is no black in the painting. 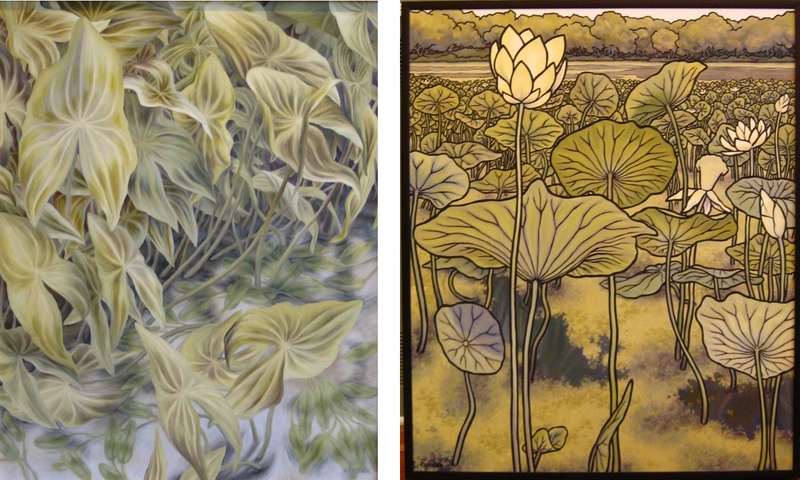 These two oil paintings were reworked by the artist. Julia likes the result of these two very much. "They look like new paintings," she says. 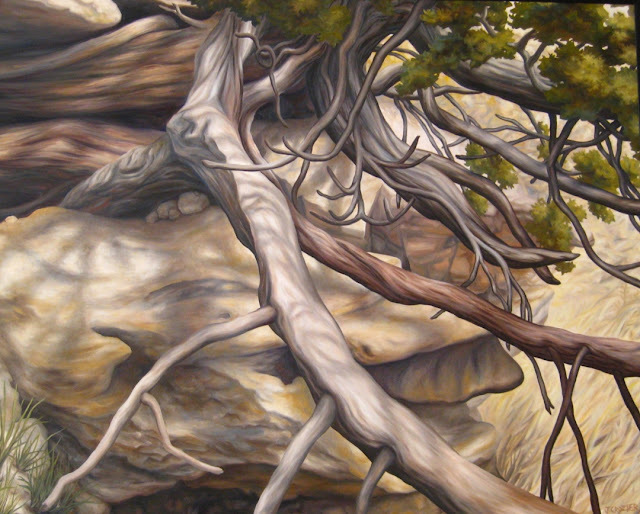 Two other oil paintings are Tree Roots and the Flicker. 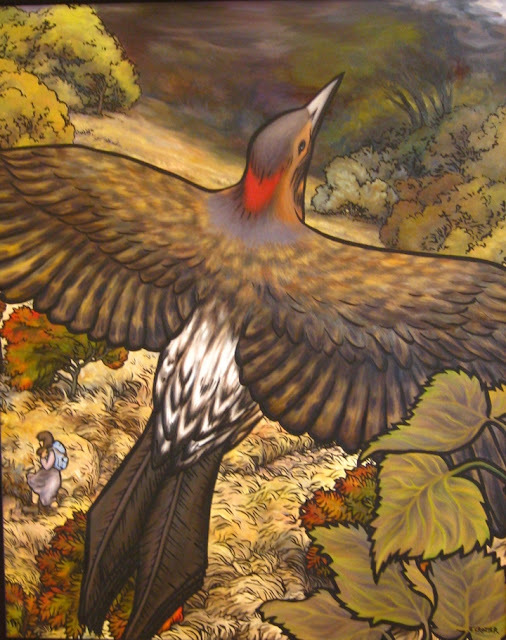 She created drawings of the flicker from a real bird that had been found dead and kept in her freezer until she was ready to create it into a painting. The painting to the far right on the wall is called Subterranean River. 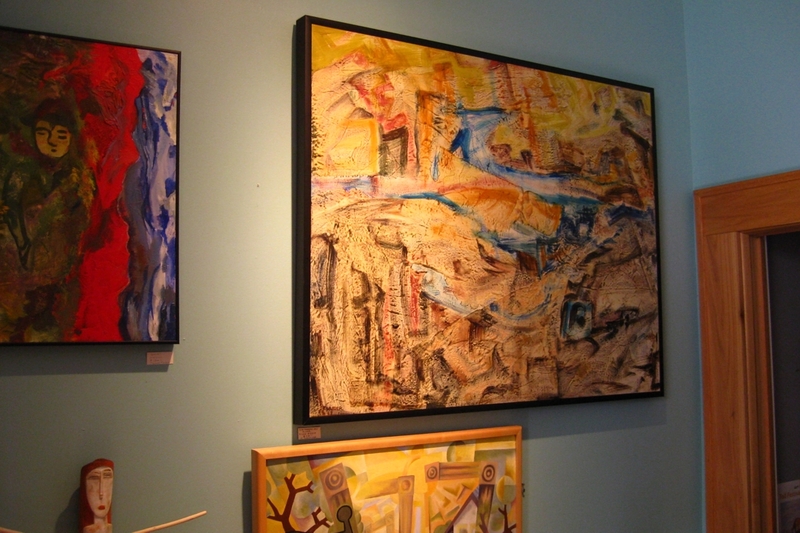 It is a multi-layered painting using encaustic, oil paints, and fabric to create the look of an underground river. This painting was the result of reading that she has done on geology, water, and underground rivers. This pomegranate tree was seen on a trip that they took into the Grand Canyon. 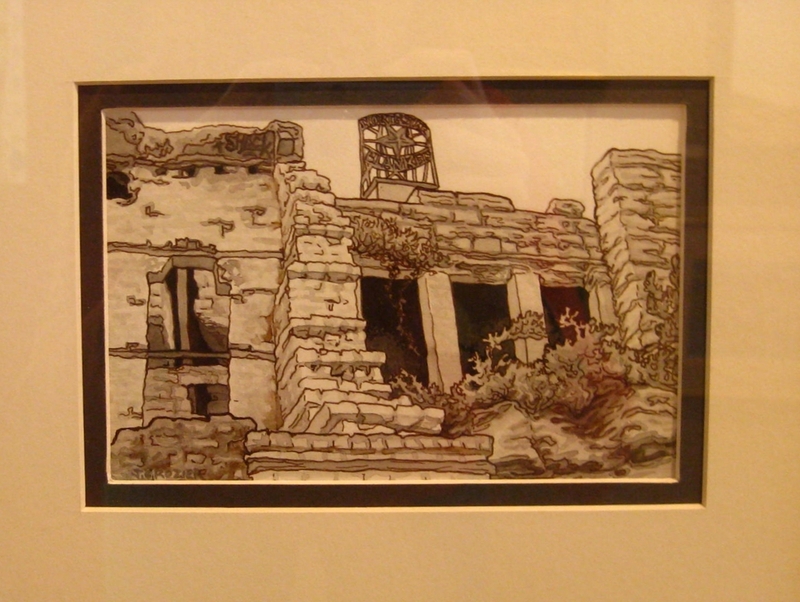 You can learn more about one of her Grand Canyon adventures on Julia’s website, blueheronstudio.net. Another trip like this is planned for May 2012 with her sister and her parents. It’ll be a rafting trip that is designed for artists with stops along the way to sketch and photograph the beauty of the canyon. This is a small ink wash drawing of the Mill Ruins near the Guthrie Theatre and St Anthony Falls in Minneapolis. She likes to work large to create what looks like a science chart. Here’s Julia and Sadie in the gallery. 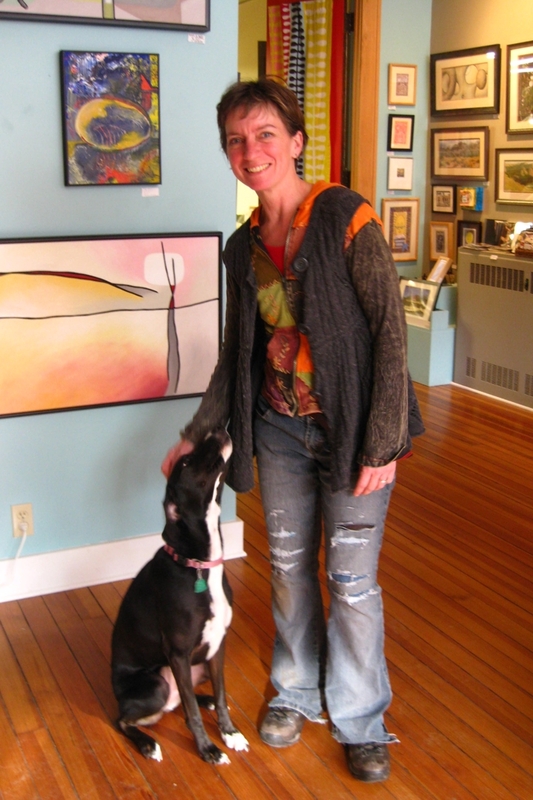 Sadie is a loving companion and a good gallery dog. This is an abstract painting on the wall behind Julia and Sadie. The painting gives the viewer a visceral feeling of space and time. 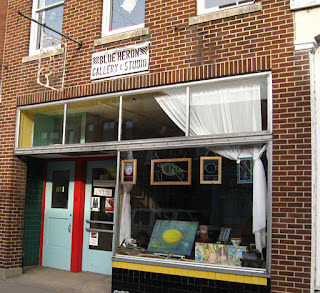 The Blue Heron Gallery and Studio has become Midwest Music Store. 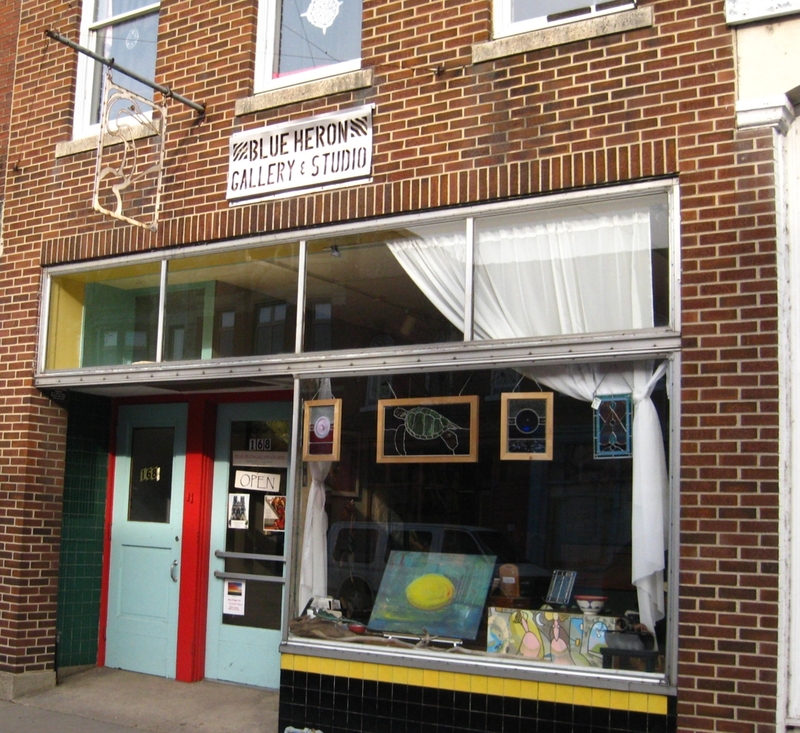 It has wonderful art along with featuring performing artists, 168 E. 3rd St., Winona, MN 55987.